"No forced slaughter" changes the confidence of some of the officers inside Vault 101 so you're not forced to kill them when the game railroads you into fighting them. It also includes a stealthboy somewhere in Vault 101 and changes the difficulty of some locks so your character build can have weight since level 1. Plus some surprises! Tale of Two Wastelands Version now available! One of the main issues I have with the beginning of Fallout 3 is that to leave Vault 101 you're pretty much forced into killing some human beings without any alternatives whatsoever. Sure, you can try to sneak your way out of the Vault and get out without killing anybody (so, credit where is due to Bethesda for that) but if you are caught by any of the Vault 101 officers, it's either you or them, with no third option. Well, until now. I started thinking about what was these officers' job until now and realized that, for most of their lives, the only thing these guys needed to do to keep order inside the Vault was to raise and eyebrow or their voices a bit. So even if some of them are bullies and sociopaths and a couple might be psychopaths, they have never killed anyone before the moment James leaves the Vault. Then I wondered, how would most of them respond when an 18 year old who is fighting for his/ her life, shoots at them and hurts them. Would they run or would they fight to the death? You guessed right. Why would they? So I went into the CK and changed their confidence to be average instead of foolhardy. Now, if they are hurt and feel themselves at a disadvantage, they will run away from the player and ask for help. This way, you can still confront them, hurting them in one arm or leg so they are aware you are gonna fight back! However, not all the guards' confidence have been changed. Those who can be avoided easily by the player were left as foolhardy to set a dilemma. Do you avoid these guards? Or do you try to help these other dwellers but then you're forced to kill these guards? 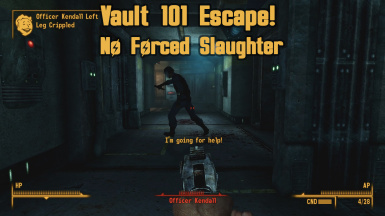 "Vault 101 Escape : No forced slaughter" changes the confidence of some of the officers inside Vault 101 so you're not forced to kill them when the game railroads you into fighting them. It also includes a stealthboy somewhere in Vault 101 and changes the difficulty of some locks so your character build can have weight since level 1. Plus some surprises! I recommend that you also use my mod That middle-aged guy: A dialogue overhaul mod that gets rid of some of the most infamous original game's lines and changes most of the game's dialogue to accommodate more roleplaying options. Also, check my mod Farms of the Wasteland that adds crops, characters and farms to the different settlements! Also recommended (and compatible) are Vault 101 Overhaul﻿ (by crazyplaya) that adds a room to your father inside the Vault as well as a storage room and Overseer's secret stash (by Richwizard) that adds, well, a secret room with provisions and things that make sense given the context of the game. Thanks to Bethesda for creating a great game and thanks to this community for enhancing it so much. Thanks to Rainvendor for the TTW version!